As a child, there was never anything more exciting to look forward to at back to school time than to go shopping for new clothes and shoes. But as a mom, this time of year can lead to feeling overwhelmed, because our kids’ closets are full of too-small clothing, pants with holes in the knees, and are so packed with clutter that you can’t fit the laundry in there, let alone new school clothes. 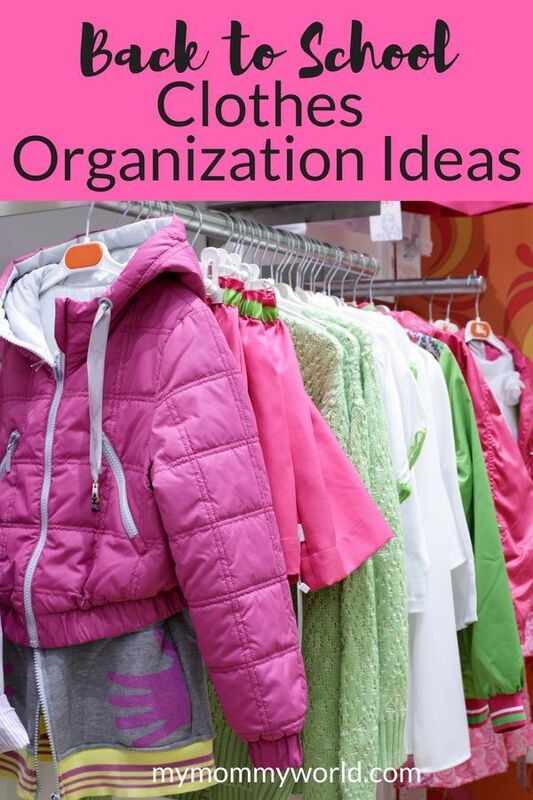 After using these back to school clothes organization ideas, you’ll have your kids’ clothing needs fulfilled with much less hassle than before, and will be able to make their closets organized and clutter-free, so that they can easily find outfits to wear on school mornings. The first step to dealing with the back to school clothes overwhelm is to go through your kids’ closets and purge anything that you don’t want to keep. Your kids can help with this…it’s a good way to learn to organize! Make your kids try on everything in their closets to check sizing, and ask them what pieces they like/dislike wearing. Put torn, stained or worn clothing into the garbage; place the rest into a pile for donation to a local charity or Goodwill. You may also try swapping kids’ clothes with your neighbors, which is fun, and a good way to save a little money! Don’t forget to go through your kids’ pajamas, socks, underwear and shoes, getting rid of anything outgrown, or anything that has holes or is too worn out. Next, make a list of what you need to buy, taking into account what is left in their closet. Need more hangers or bins for their closet? Make a note to get those at the same time that you are out shopping so that you have all the tools that you need to get that closet organized. Now that I have a tween, school clothes shopping has gotten a lot more difficult. She is now REALLY into clothes, so we can’t just go inside a store, pick out a few things and be content. We now spend A LOT of time searching the racks for the PERFECT pieces, because she can’t just wear any old thing to school anymore. This year, however, we found something that made shopping so much easier: a capsule wardrobe. I tried a capsule wardrobe for myself earlier this year and fell in love with it. Not only do I look a lot better, but it makes shopping so much easier. Essentially a capsule wardrobe is a prescribed set of clothing pieces that you can mix and match to create many different outfits. So you just go to the store and purchase the tops, pants, shoes, etc. that are recommended in the capsule (or items that look similar to what is in the capsule), and you’re all set…and guaranteed to look on trend! The other benefit of using a capsule wardrobe is that you only buy what you need, which really cuts the chance of having clothes clutter, and makes it more likely that your kids will actually wear everything regularly. This year I purchased the girls’ back to school wardrobe capsule from Get Your Pretty On (NOT an affiliate link…just something I’ve used personally and loved) for my daughter and we were both thrilled…she was happy because she loved the clothes, and I was happy because there was no arguing over outfits or spending hours deciding on clothes in the mall. If you’d like to try out a capsule wardrobe for your kids, you can download one for free from Corina at NowThatICanDo.com. You can also design your own capsule wardrobe, if you have a good eye for fashion. Just make a plan for the items you need and stick to it in the store so that you don’t overwhelm your closet with too many items (or buy things that your kids’ don’t end up wearing). This time of year is great for clothes shopping for kids, since there are so many good sales! I like to stock up on staples like underwear and socks at this time, because they are usually on sale and since I really only have to buy them once a year (unless we have a really big growth spurt), they last until the next big sale. You can also get a lot of coupons for future shopping trips during this time of year, which can help you stick to your budget. A few years ago, I bought most everything my kids needed for fall and winter at back to school shopping time in August. At the register, I received a whole bunch of store “cash” to use a month later, which I thought was great. But a month later, when I went to the store to spend that “cash,” I found that there was nothing my kids needed, since I had already purchased everything. Now that I’ve learned my lesson, I usually buy a few things in August, then wait until the “cash” spending window comes up, then buy the rest of their school clothes…which usually works out well, since by then, the sweaters, sweatshirts and coats for winter are in the stores. When you bring back all your kids’ new school clothes, it’s time to get everything organized in their closets and dresser drawers. Because we’ve already cleaned out the closet and drawers, there should be a good deal of room for the new stuff to go. And because we used a plan for shopping, and didn’t overbuy, it should all fit comfortably inside the closet and dresser. I usually leave dresser drawers for things like socks, underwear, pajamas…things that we don’t worry about looking wrinkled. Everything else is hung up in the closet. (Extra dresser drawers are used for blankets, toys or just left empty). Long-sleeved and short-sleeved shirts and tops are hung together on one side of the closet, and shorts, skirts and pants are hung up on the other side, making it easy for my kids to find things. I love the hangers that are used in the stores to hang up my kids’ pants…the ones that clip to the top of the pants. If you can keep the hangers from the store when you buy pants, keep them! Over time, I’ve collected so many that we have plenty to hang up both our kids’ pants…and I even use them for my skirts too! Shoes are lined up on the floor of the closet, or kept in our hallway bench in the entry of our home. Using this simple system, my kids can easily find an outfit in the mornings during the school rush, and can easily put their laundry away. Organizing your kids’ clothing during back to school time really pays off during the rest of the year. Knowing that everything fits, that they can easily find outfits, and that they have enough clothing to get them through the seasons takes a big load off a mom’s shoulders. Great tips for getting organized, Erin. I know we purge the kids clothing twice a year. It makes it so much easier to keep on top of what items they really need and to watch for them to go on sale. I always have them go through their closets to see what they need before the back to school sales start so we can look for the best buys on what they need. I like your idea of purchasing a few things and then using the cash later. I’ve had cash like that expire because we just didn’t need anything when it came time to redeem them.